What are the major geospatial technology trends for 2019? How is Vancouver Police driving down crime with machine learning and spatial analytics? Have you checked out the new Community Map of Canada vector cache? See what’s happening in Canada and globally in the world of Spatial Data Infrastructure (SDI) through this collection of the latest and most significant SDI news, data, products and events this month. Police in Vancouver is cracking down on burglary with a machine learning solution that uses an algorithm to deconstruct crime patterns. Through spatial analytics, they are able to predict where residential break-and-enters will occur and place police patrols accordingly. The department first tried this technology with a pilot test that reduced burglary by more than 20% month over month. Now they are making the approach common practice. Geospatial technology is ubiquitous and the breadth of its reach in multiple fields is growing rapidly. Most technologies require a spatial component and geospatial is one of the pillars of emerging applications. In 2019, new trends in geospatial technology will have an impact on many business sectors. Here are the major geospatial trends for 2019. The U.S. released a second report card from its ongoing review of the U.S. NSDI. This report card serves as a periodic assessment of the condition of the nation’s geospatial data infrastructure, which is essential for the U.S. economy, health, safety and activities of daily life. Each of the national framework data teams assessed the developments and advances within their respective themes since the 2015 report card. The whole NSDI also received its own grade, a B-, reflecting some improvements over its 2015 grade of a C.
UN Statistical Commission (UNSC) holds 50th session on the theme, 'Better data, better lives'. The UNSC brought together chief statisticians from UN Member States, including Canada. During the 50th session, the discussion on data and indicators for the 2030 Agenda included reports on open data, statistics, big data and the integration of statistical and geospatial information. 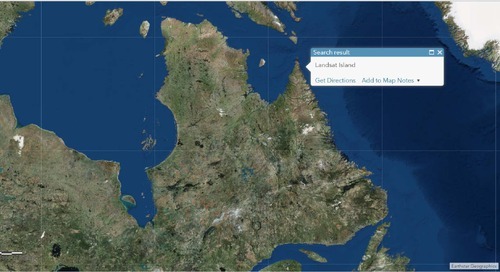 Esri Canada has been working on producing an accurate and up-to-date topographic national web basemap for some time with data contributions from communities across the country. Until now, efforts have focused primarily on contributing to the raster topographic basemap that is hosted on ArcGIS Online. The beta version of the Community Map of Canada vector cache is updated every 24 to 48 hours with the latest updates supplied by contributors to the Community Maps Program via the GeoFoundation Exchange (GFX). Natural Resources Canada (NRCan) recently added a new data layer to the Federal Government Open Data portal to help with emergency management (particularly for flood and earthquake risk analysis). The data layer consists of delineated building footprints with height and elevations automatically extracted from LiDAR data and other sources. The dataset contains close to 1 million building footprints in several different geographies across the country. Natural Resources Canada is increasing the HRDEM product coverage by 30,000 km2 by publishing 21 new datasets in six provinces (BC, SK, MB, ON, QC and NB). You can download HRDEM data from the Open Government Portal. The National Elevation Data Strategy aims to increase high-resolution elevation data coverage for Canada and improve accessibility to the products. Ordnance Survey's more than 500 million unique geographic features now attract over 100,000 updates every day. Britain's national mapping agency collects, maintains and distributes geographic information for over 4,700 public and private sector organizations. A key part of the strategy is developing a more open geospatial data infrastructure that combines accuracy with accessibility. Back in 2017, Spatial Reserves listed top 10 portals that were found to be the most useful–rich with content, easy to use and with metadata that is available and understandable. The list has been updated in 2019. “Most useful” really depends on the application that one is using GIS for, but the list should be useful for GIS users across many disciplines. Some allow for data to be streamed from web servers into your GIS software whereas all allow data to be downloaded. The Esri Developer Summit is designed to show users how to build cutting-edge apps using advanced mapping technology from Esri. Watch these DevSummit plenary videos to learn about new tools for geo-enabling apps and get pro tips from the developers who made them. Creating accessible web content matters for everyone. If your organization uses ArcGIS Hub to create sites that share data and information related to internal projects or public initiatives, understanding and applying principles of accessible web design supports you in providing the best experience for everyone, including those with a disability. These days, there is no shortage of data available on open data portals, including those on ArcGIS Online (such as the Living Atlas of the World). But there will always be a need for people to map their own data. Check out these educational instructions on methods of mapping your own data.